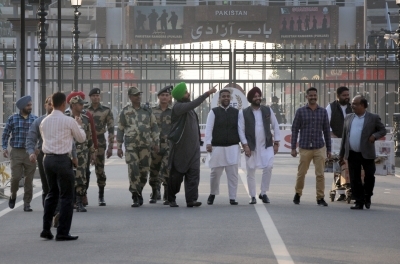 DEC 08 (IANS) - The controversy surrounding Navjot Singh Siddhus pilgrimage to Kartarpur Sahib must have amused President Ram Nath Kovind whose visit to Pakistan in August 2003 as part of a 30-member delegation of political leaders and journalists was one of the most high profile visits in the history of exchanges between the two countries. Kovinds fellow BJP comrade in the delegation was Balbir Punj, whose sense of wonder at the warmth and hospitality from the official to the street level was one of the features I remember. Restaurants would offer food gratis, shops would not accept payments from "our guests from India". The delegation's visit, a huge public relations success, was followed up in January 2004 by Vajpayee himself. Yashwant Sinha, as Foreign Minister was able to issue, not an agreement but only a press statement which contained the crucial commitment: "President Musharraf reassured Prime Minister Vajpayee that he will not permit any territory under Pakistan's control to be used to support terrorism in any mannerâ€¦"